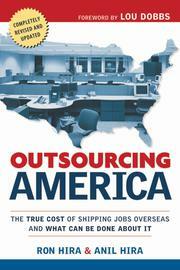 One of the most controversial topics in the news is the outsourcing of American jobs to other countries. Outsourced jobs have extended well beyond the manufacturing sector to include white-collar professionals, particularly in information technology, financial services, and customer service. Outsourcing America reveals just how much outsourcing is taking place, what its impact has been and will continue to be, and what can be done about the loss of jobs. More than an exposé, Outsourcing America shows how offshoring is part of the historical economic shift toward globalism and free trade, and demonstrates its impact on individual lives and communities. In addition, the book now features a new chapter on immigration policies and outsourcing, and advice on how individuals can avoid becoming victims of outsourcing. The authors discuss policies that countries like India and China use to attract U.S. industries, and they offer frank recommendations that business and political leaders must consider in order to confront this crisis—and bring more high-paying jobs back to the U.S.A.